Leafless perennial shrub of the cactus family -cactaceae- up to 5 m. Succulent stems, formed by superimposed cladodes, bearing spines in groups of two or single. Sessile yellow flowers. 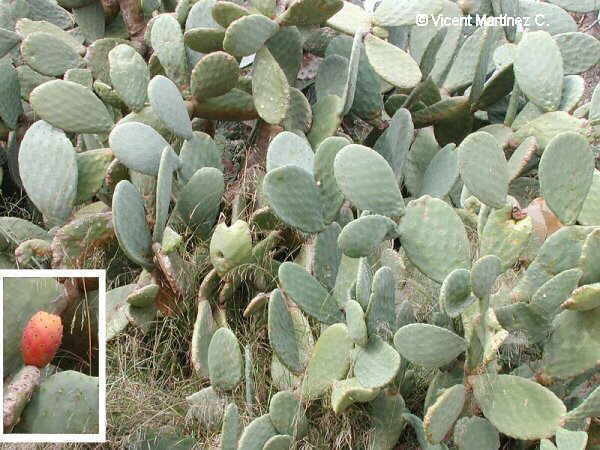 The fruit is a berry, with spines, till 9 cm, edible (Prickly pears). Native from Mexico, is being cultivated and naturalised in warm dry terraces next to the sea.